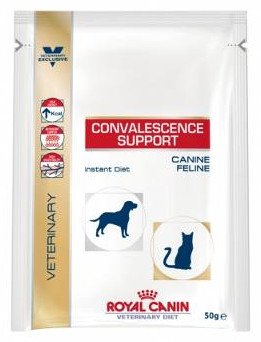 Royal Canin Convalescence Support is a nutritional support diet for dogs and cats for nutritional restoration and convalescence. This is often from such conditions as anorexia, malnutrition, post-surgery or pregnancy, helping to replenish energy reserves and nourish your dog from the inside out. The unique recipe contains a beneficial blend of antioxidants and omega fatty acids to support and protect cells and DNA, whilst acting to strengthen your dog's natural defenses. The omega acids will also support and lubricate joints, aiding mobility and restoring the health and function of internal systems. With high levels of protein to promote complete health and recovery in times of weakness, illness or discomfort. Available as a wet food in cans or as a powdered food which should be mixed with water to create a complete liquid diet. CONVALESCENCE SUPPORT is a complete dietetic feed for dogs, formulated to promote nutritional restoration during convalescence. This feed has a high energy density and a high concentration of essential nutrients which are highly digestible. High Protein - An increased protein level promotes lean body mass regain while enhancing palatability during the postoperative period. Anti Oxidative Stress - The synergistic antioxidant complex (Vit E, Vit C, taurine, lutein) reduces cell stresses caused by oxidative stress. EPA/DHA - Eicosapentaenoic and docosahexaenoic acids, omega-3 long chain fatty acids has a beneficial effect on joint mobility, skin health and digestion. High Energy - The high energy density allows covering the dog's energy requirements while helping reduce the amount of food given per meal, thus decreasing the digestive workload. It also helps promote weight regain during a convalescence period. Composition - Meat and animal derivatives, cereals, fish and fish derivatives, oils and fats, minerals, derivatives of vegetable origin, vegetable protein extracts, vegetables, molluscs and crustaceans, various sugars. Additives (per kg) - Nutritional additives: Vitamin D3: 200 IU, E1 (Iron): 15 mg, E2 (Iodine): 0.13 mg, E4 (Copper): 0.9 mg, E5 (Manganese): 4.5 mg, E6 (Zinc): 45 mg.
Analytical constituents - Protein: 11% - Fat content: 8% - Crude ash: 2.5% - Crude fibres: 1% - Moisture: 72% - Metabolisable energy: 1302 kcal/kg - Omega 6 essential fatty acids: 1.05% - Omega 3 essential fatty acids: 0.5% including EPA/DHA: 0.2%. High Energy - Convalescence Instant Diet has a high energy concentration (4 734 kcal/kg dry matter). Easily diluted with water, it becomes an energy dense and complete liquid diet which is highly palatable and highly digestible. Antioxidant Complex - Antioxidant complex (Vit E, Vit C, taurine and lutein) reduces cell stresses caused by oxidative stress and free radicals. High Digestibility - Highly digestible ingredients compensate for the decreased activity of intestinal enzymes, ensuring an optimal nutrient supply. Composition - Milk proteins, vegetable oils (soya), barley malt, minerals, egg yolk powder, vegetable fibres, fructo-oligo-saccharides, marigold extract (source of lutein). Additives (per kg) - Nutritional additives: Vitamin A (24000 IU), Vitamin D3 (1815 IU), E1 (Iron): 180 mg, E2 (Iodine): 0.2 mg, E4 (Copper): 19 mg, E5 (Manganese): 3.8 mg, E6 (Zinc): 133 mg, E8 (Selenium): 0.24 mg - Technological additives: Lecithin: 20 g Antioxidants. Analytical constituents - Protein: 42% - Fat content: 24% - Crude ash: 7% - Crude fibres: 3% - Metabolisable energy: 4430 kcal/kg. There are currently no questions for Royal Canin Veterinary Diets Convalescence Support Dog & Cat Food - be the first to ask one!